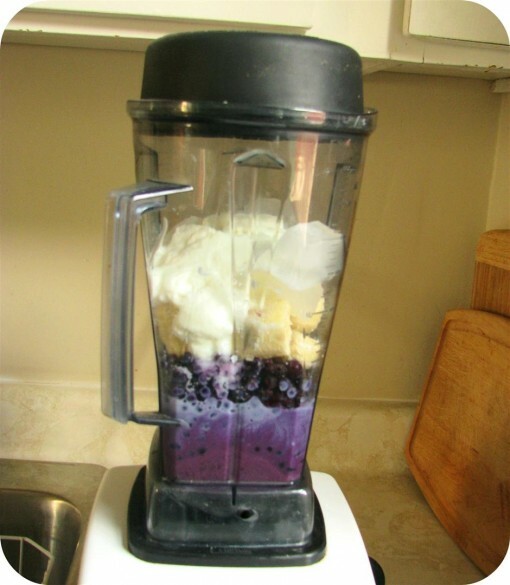 Wild Bluberry Shake was posted on October 17th, 2011 and is filed under Breakfast, Dairy Free, Drinks & Smoothies, Kid Friendly, Recipes, Vegan. This entry has 22 comments. You can follow any responses through the RSS 2.0 Comment Feed. We’re now on the road again…we spent about a week and a half of bliss at my sister’s place and it was so wonderful to have time with her and her family. Because she lives so far from our home, we only get to see her 2-3 times a year. Us three sisters are very tight and it’s hard not to see her often. While we were there, I made lots of smoothies for us all to enjoy. Especially since we were all trying to fight colds (which we unfortunately got) it was very important to avoid sugar. So instead of dessert I would often make a smoothie instead. At home I like to measure everything so it’s an easier recipe to follow…but for this one, I just dumped all the ingredients in the blender and whizzed it up. Blend. Blend. Blend. Aren’t the layers of colours pretty? This makes enough to share with 4-6 people. Garnish with a few blueberries (Aren’t the wild blueberries fun? I had never tried them before). And this little sweetie loved it! I love my niece’s blueberry smile…she melts my heart. We had such fun together…she makes me laugh. We had such fun bouncing on the trampoline, reading books off my iPod, tickling, and cuddling…I miss her! Do you have any nieces or nephews? Does your family live close? Yum, I love blueberry & peach together! I love blueberry & banana combo, there is a smoothie place in my area that calls their blueberry & banana smoothie “turning violet.” With the peach I bet it tastes great! I hate saying goodbye to family I don’t see very often, we usually don’t make it a big deal and say “see you later” I have 2 nieces and 1 nephew who live in FL (I’m in NY) I miss them always! I have FOUR nephews, all of whom are not old enough to play sports yet, witty bitty things. The next one better be a girl… I want to buy hair bows! I have a nephew, he lives about an hour and a half away so I usually see him every two weeks- either my my sister brings him up to see us or my mum will bring him up for us to baby sit for a couple days. He’s so funny, two years old and currently he’s like a sponge-observing everything we do and repeating. I wonder if he’ll like this smoothie! Lovely recipe but may I ask where you bought those beautiful tumblers in the first picture?? The color of this shake looks amazing. This must have tasted so good! Oh this makes me miss my sister and her children who live so very far away! Lovely photos and delicious looking shake! I have four sisters and one just moved 8 hours away. Its a long drive but we make the trip every other month. Sisters have a very special bond! :) This shake looks beautiful! I will have to give it a try. I love your niece’s blueberry smile too :) this is such a great post. The shake looks so yummy and Love the way it simple t make. It looks uber yummy!!! And your pics are so gorgeous. What camera is it? :P its really pretty… and your niece, oh so cute! p.s. I’m having a dress giveaway from shabby apple if you’d like to check it out. Your niece is such a little sweetie! Love the smoothie — so healthy and refreshing! 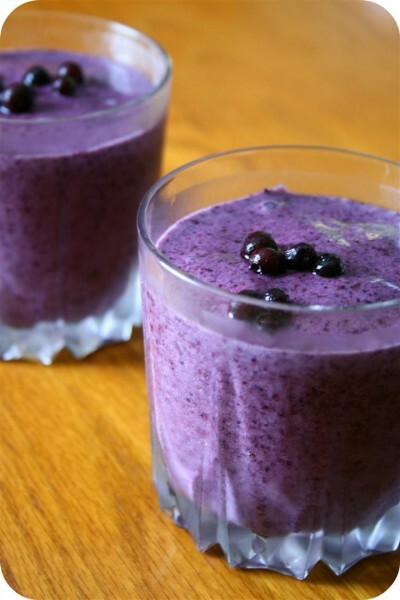 I love blueberries and this looks super delish !!! I would like to share the Liebster Blog award with you , please accept it :). Rebecca~ I’m afraid I don’t know. These pictures were taken at my sister’s place, so I’m not sure where she got her tumblers. Esther – It all depends on what kind of coconut milk you use (how high in fat, ect)…but for a serving (based on 6 servings) it will run from 200-250 calories (using high fat coconut milk as a base). I love this smoothie so much!!! Sarah – Wild blueberries are my favourite!